There is a new pilot program called Puppies Achieving Worthy Services (PAWS) which works with the Nashville Humane Association and the Tennessee Prison for Women. Qualified inmates care for a dog for a 6 week period under the guidance of the Animal Behavior Program Manager at the Nashville Humane Association. 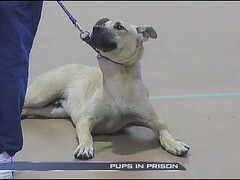 The team of two inmates will care for and teach the dog basic commands and manners and the dogs will be house and crate trained. At the end of the 6 week period, the dog will return to the Humane Association and find a loving home. Not only do the dogs learn, but also the inmates learn some life long and career skills and get the calming and therapeutic benefits of having a dog. This entry was posted on Monday, May 7th, 2007 at 3:55 am	and is filed under Dogs, National Dog, Cat & Pet Info, Animal Shelters & Charity. You can follow any responses to this entry through the RSS 2.0 feed. Both comments and pings are currently closed.